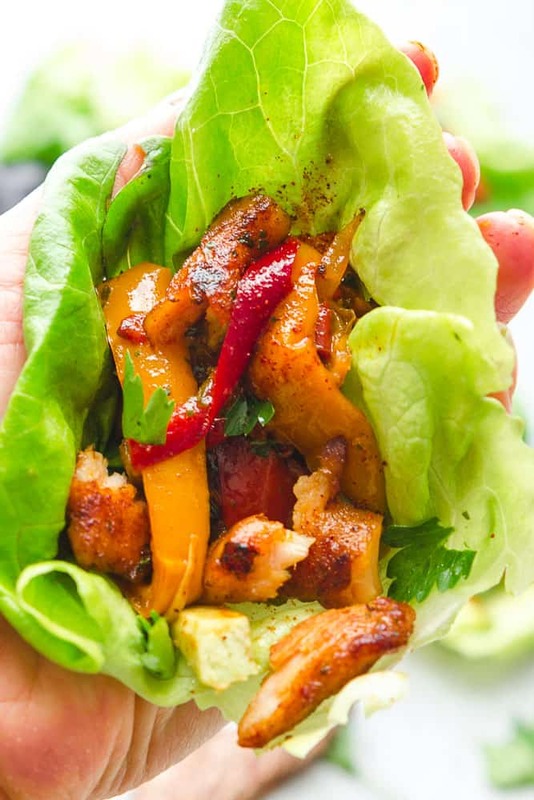 Chili Lime Chicken Lettuce Wraps – an easy low carb way to enjoy fajitas. Best of all, less than 30 minutes to make and perfect for lunch or a lightened up dinner for busy weeknights! Lettuce wraps are one of our favorite things to make when we want to have a quick and healthy meal. The kids filling their own plates with their own customized fillings. 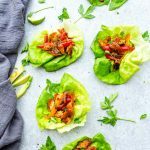 These Chili Lime Chicken Fajita Lettuce Wraps are fresh, flavorful and super simple to make with a homemade fajita seasoning! Less than 30 minutes to make so they’re perfect for busy weeknights. Whenever we have company, we love serving lettuce wraps as a fun appetizer. This recipe is also Whole 30, paleo and keto-friendly. You can easily double the amounts if you want to serve these at your next spring or summer party as well. And if you’d rather enjoy a low carb meal in a bowl, layer the chicken filling over some cauliflower rice or zoodles. 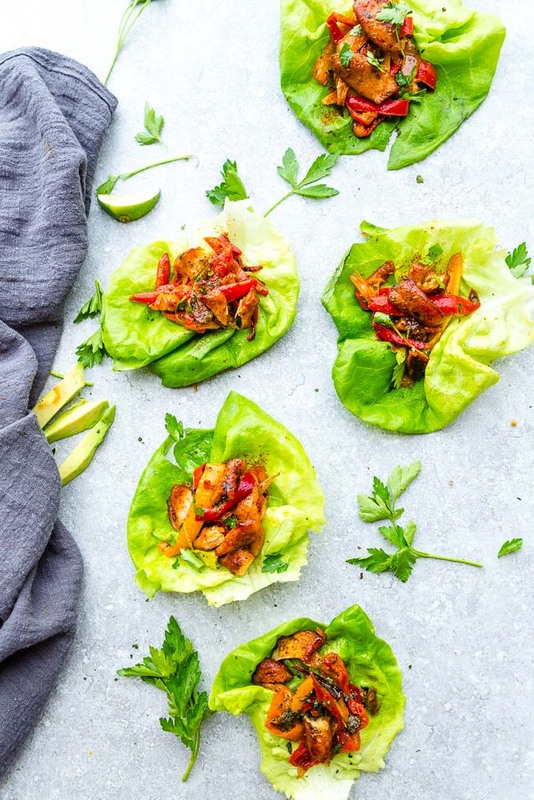 These Chili Lime Chicken Lettuce Wraps would make the perfect light lunch, dinner or even appetizers for your next spring or summer party. Grab an ice cold drink and enjoy them on the patio or deck for your next Mexican fiesta. 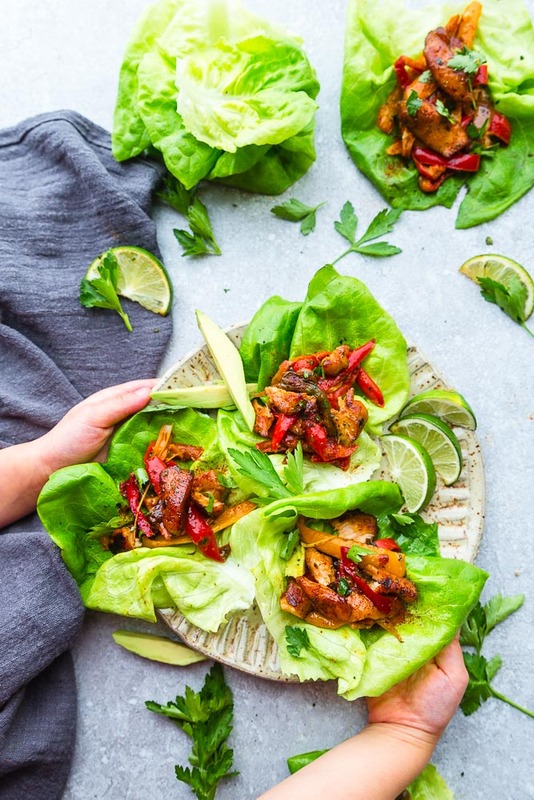 Chili Lime Chicken Lettuce Wraps – fresh, flavorful and a healthier way to enjoy fajitas! Less than 30 minutes to make and perfect for lunch or a lightened up dinner for busy weeknights! In a medium bowl, combine 1 tablespoon of olive oil, chopped cilantro, lime juice and 3-4 teaspoons of the fajita seasonings. Reserve 2 tablespoons of the chicken marinade for drizzling on the chicken at the end. Pour remainder of the marinade into a large zip-top bag along with the chicken. Seal bag tightly and press the bag with your hands to evenly distribute the marinade and allow to sit while you prepare the vegetables. Heat 1 tablespoon olive oil (or butter for keto) in a 12" skillet over medium high heat. Add the onions and allow to cook for about 5 minutes, or until softened and fragrant. Add the bell peppers and sprinkle with 1 - 1 1/2 teaspoons of the reserved fajita seasonings. If you like the peppers with a nice crunch - cook for about 3-5 minutes. And if you like them softer, leave them on for about 3 minutes longer. Transfer and set aside on a plate. Melt remaining 1 tablespoon of oil on the same skillet and brown the chicken. Cook for 5-6 minutes, or until cooked through. Add the reserved chicken marinade to the skillet and cook for an additional 30 seconds. Remove from heat.